Ricoh GXR will have its own mount for Leica lens. Introduced back in late 2009, the GXR DSLR digital camera from Ricoh introduced an unique modular design. It makes use of an innovative slide-in mount system used to attach interchangeable units that integrate the image sensor, image processor and the lens. This offered a better image quality as the lens and the sensor are tuned to work together and achieving the best performance. Last year the new GXR modular design was awarded with the ‘Innovative Imaging Product of the Year’ by Australia’s Camera Magazine. The new mount will make the GXR users able to add new series of lenses (like Leica M) but losing the sensor-lens integration feature. The mount will come with 12.9 megapixel CMOS sensor (APS-C size / 23.6 mm × 15.7 mm) and a new focal plane shutter. 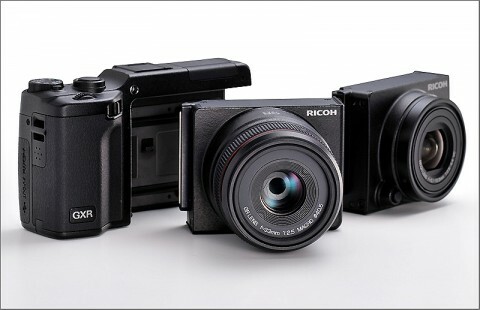 As announced by Ricoh, the GXR Lens Mount Unit will be available in September with price to be announced. You can get the Leica M mounts for about 240$ these days.